Rosa Salazar and Keean Johnson en una escena Alita: Battle Angel (2019), en Iron City. February is never a big box office month and this Valentine's Day weekend saw another slow frame with newcomer Alita: Battle Angel taking first place on a modest $27.8 million. This dystopian cyborg movie is adapted from an early 90s Japanese manga comic series by Yukito Kishiro called Gunnm. James Cameron owned the rights since Titanic’s days and was supposed to direct the film. But as he was too busy finishing the sequels to Avatar eventually asked his friend Robert Rodriguez to take the helm. Rosa Salazar is the intrepid title heroine, half human and half synthetic, and with enormous saucer eyes. Christoph Waltz, Jennifer Connelly, Mahershala Ali co-star. 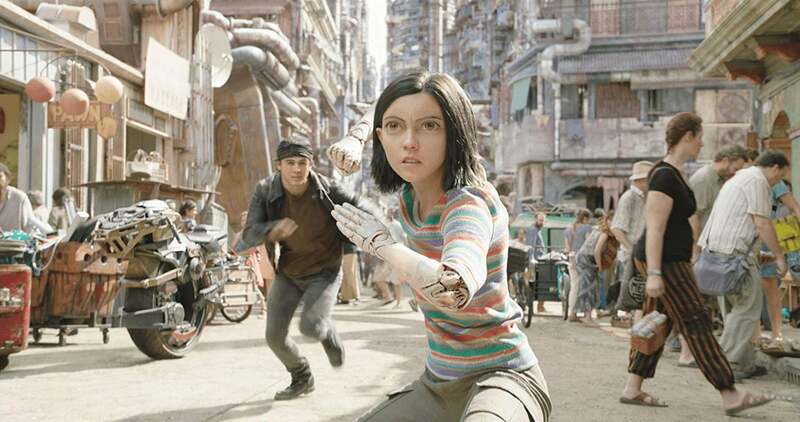 Foreign plays for Alita were worth $56.1 million in its second overseas frame and brought the film's worldwide cume to $130.8 million. That, however, is against a $170 million budget and the excitement for the China release next week has been tempered by competition from local phenom The Wandering Earth. This sci-fi phenomenon that has spread across the Middle Kingdom in the past couple of weeks is already the second highest grossing locally made picture of all time in China. The Wandering Earth is based on a novel of the same name from author Liu Cixin, his country's first and only Hugo Award-winning author. It's about a future where, as the sun is expanding and a series of massive engines have been installed on our planet to push it towards a younger, more stable star, the whole species faces extinction when these engines begin to fail. In the real world, that odyssey has brought a massive $607 million in thirteen days. It's made a notable $2.3 million in the US as well. At this rate, Wolf Warrior 2's $827 million China record isn't necessarily out of reach. Still in the Middle Kingdom local pic Crazy Alien had a $28.1 million opening, giving it the second biggest single market frame of the week. Crazy Alien is about a monkey trainer whose act is ruined when a UFO crashes into his prized primate. He then enslaves the alien pilot and trains it to perform circus tricks, but this doesn't work out too well for him. At $105 million it also has a crazy budget and may become the Chinese film industry's biggest flop of 2019. Back in the US, the second biggest new release was a rom-com from Warner Bros. called Isn't It Romantic. It earned $14.1 million in its first weekend in the US. The film makes fun of the romantic comedy genre, making its star (Rebel Wilson) aware that she's trapped in a PG-13 movie, which she then spends most of the film trying to escape. Also debuting on the domestic market, slasher sequel Happy Death Day 2U. It earned $9.8 million for Universal and Blumhouse. For Blumhouse standards, it has a very high budget at $25 million, the studio's third biggest to date. It could become a rare miss for the boutique horror studio, and given the unusually high investment, one of its costliest. Next week we'll see if Alita can find any space in The Wandering Earth's China, while How to Train Your Dragon: The Hidden World opens in the US.